Thanks to Penn’s Green Campus Partnership, QuakerFest is becoming more environmentally sustainable. This year, QuakerFest, the alumni tailgate held before the Homecoming football game, will be a zero-waste event, in line with the University’s ReThink Your Footprint waste minimization awareness campaign. A zero-waste event is an event where at least 90% of event waste is diverted from landfills. All waste that is produced at the event will be recyclable, compostable, or reusable. The goal of the ReThink Your Footprint campaign is to raise the level of conversation about waste management beyond solely recycling and into a broader discussion of source reduction and reuse – resulting in greater diversion of campus waste from the landfill. ReThink Your Footprint culminates during three weeks, November 4 – 22, with an awareness campaign designed to engage the entire Penn Community. In support of our Climate Action Plan’s goals in the area of waste minimization, an assortment of initiatives, events, presentations, and other forms of outreach will take place during this period to share information about environmentally sustainable practices in source reduction, reuse, and recycling. With up to 1,000 people attending QuakerFest, this event is a perfect opportunity to demonstrate ReThink Your Footprint in action. At QuakerFest, all plates and utensils will be compostable. Student volunteers will help attendees with zero-waste decision-making when they finish eating at the QuakerFest picnic. 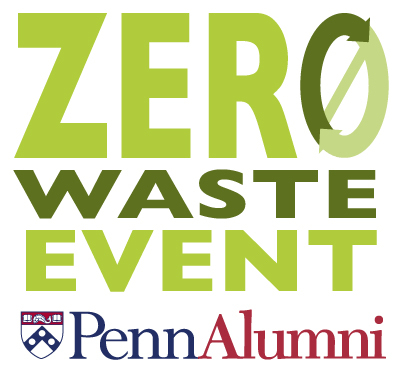 Other volunteers will help explain what zero-waste events are and how this event ties in to Penn’s Climate Action Plan goals to attendees. Click here to view all Homecoming Weekend events. Jessica King, C’15, calls herself “a child of public school.” King was admitted to the University of Pennsylvania as an early-decision applicant. 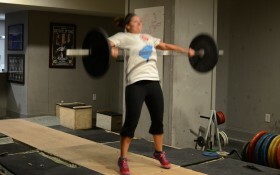 She received a “healthy” federal grant package including a work-study program award. Now a junior communications major with a specialization in civic communication, King has held jobs in the Community School Student Partnerships program of Penn’s Netter Center for Community Partnerships since her freshman year. She found the mentoring work so fulfilling that she stayed with the program. In her sophomore year she rose to a senior staff position as director of CSSP at Lea site in West Philadelphia where 30 mentors serve 10-15 classes. “Today, I oversee a board of 16. The CSSP organization as a whole has 300 mentors through the work-study program at five elementary and high school sites,” she says. Despite enjoying her work in the traditional public school arena and years of attending conventional public schools in Boca Raton, Fla., where she grew up, her dream job is to work as a principal of a charter school. 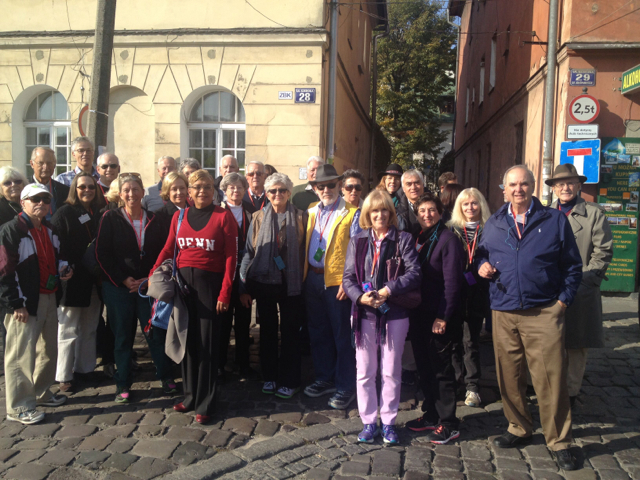 The title of our Penn Alumni Travel cruise was “Symphony on the Blue Danube,” and although we heard no symphonies (at least no complete symphonies) and spent more days off than on the Danube (which is famously green), the trip was nothing if not true to its musical theme. Even the boat (“Amadeus Elegant”) was musical, with its three inside decks named after Haydn, Strauss, and Mozart. The trip’s musical offerings began on our first evening on the boat, docked on the Danube at Budapest, with a delightful on-board performance by the Lugosi Band – clarinet, violin, cimbalom and dancers – playing a variety of Hungarian and Hungarian-Gypsy dances (including the ubiquitous “Csardas” composed by the Italian Vittorio Monti in 1906), as well as some Brahms Hungarian Dances. Four dancers accompanied the band. It was an altogether spirited evening, and the virtuosity of the instrumentalists – not only in their musicianship, but in the rhythmic clapping and slapping of legs and heels – was striking and impressive. Audience participation was encouraged. Karen Goldstein being a good sport. 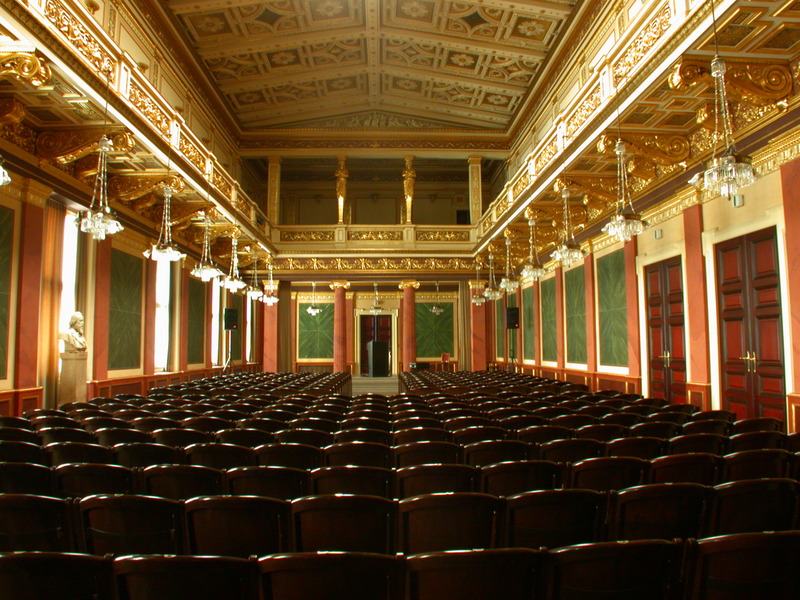 The Brahms-Saal of the Musikverein. The next day (Thursday, October 3), we were treated to a morning concert: the Mozart Ensemble, a string quartet, played a full program of Mozart, Dvorak and Haydn – all, with the exception of the Dvorak (a slow movement from his “American Quartet”), performed in their entirety (Mozart Quartet K. 157 and Divertimento K. 138 and Haydn Quartet op. 9, no. 6). 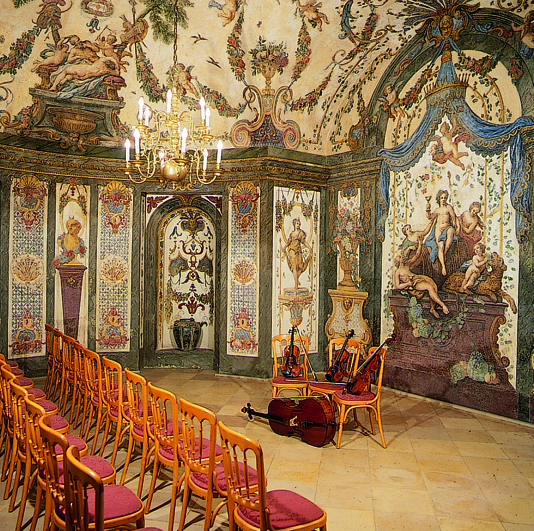 Again the venue, the “Sala Terrena” (“ground-level room”), was remarkable, both historically – it is the oldest concert hall in Vienna, and Mozart played there – and aesthetically, with its 18th-century, fresco-covered vaulted space in the Renaissance Venetian style. As it seats only seventy people, the performances were given in shifts, and we attended in two groups. In the evening, still docked in Vienna, we were treated to another on-board concert, this time a small ensemble (two violins, cello, piano, soprano) performing light Viennese music from the 19th and early 20th centuries – Strauss waltzes and polkas, arias from Strauss and Lehar operettas, pieces by composers like Johann Schrammel and Karl Michael Zierer. Introducing the music was a very tall Viennese, who spoke easily, informatively and in excellent English. 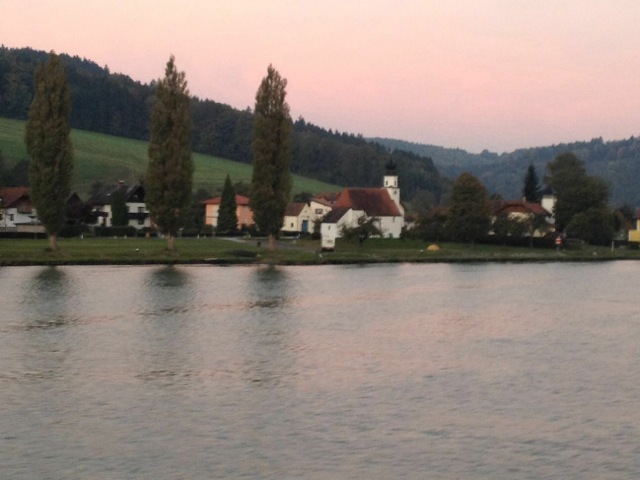 In the dead of night on October 3 the Amadeus Elegant slipped away from Vienna, and we awoke the next morning to find ourselves in the splendid Wachau Valley. After an early stop in medieval Dürnstein (no music), we proceeded to the magnificent early eighteenth century Benedictine abbey at Melk on the Danube’s south bank. 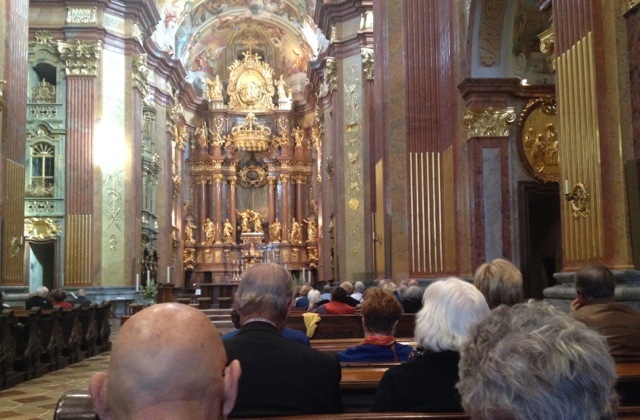 There we heard a brief organ concert – the music was not identified, but the consensus was that it was Bach – performed by an 85-year old monk, who had been our guide’s music teacher. The Biddles and the Blairs enjoying Melk’s organ. 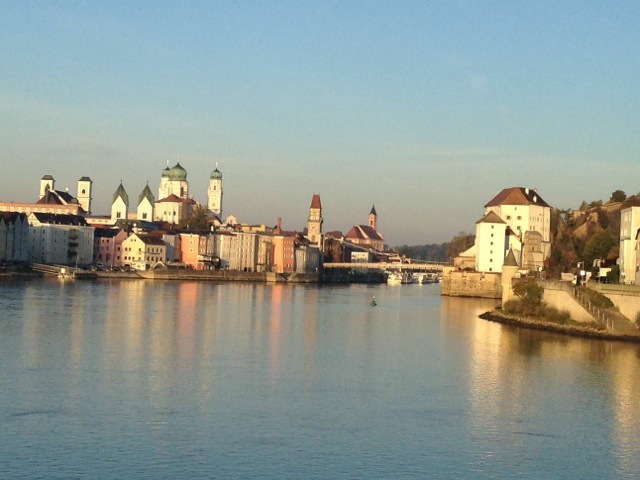 The walking tour through Passau culminated in the baroque Cathedral of St. Stephen, a late 17th century structure whose organ is the fourth-largest organ and the largest cathedral organ in the world, with almost 18,000 pipes and over 200 registers. Before climbing up to her loft, the organist, Brigitte Furth, explained the workings of the Passau organ and the ways in which she would illustrate its various components and colors. The composers in her program were French (Louis James Alfred Lefébure-Wély, Jean Langlais) and German (Melchior Franck, Pachelbel, Bach). She ended with a piece by Langlais in which she sounded all five of the cathedral’s organs – each set of pipes coming from a different part of the building and ending together in a pew-shaking fortissississimo. The only other music we heard that day came from the engines of the busses on the ride from Passau to Prague. 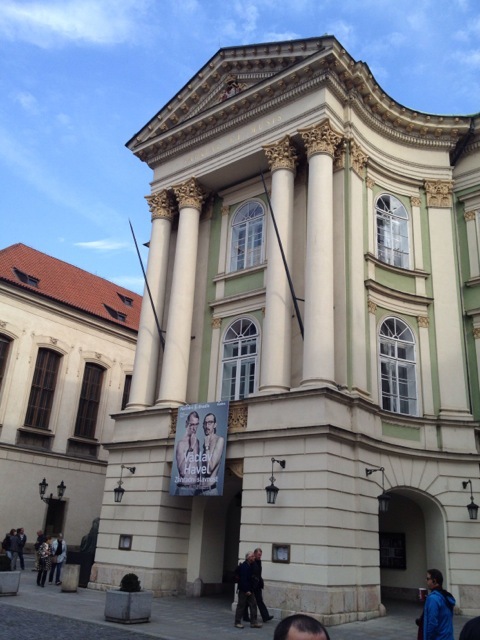 On our first day in Prague (Sunday, October 6), our guides took us to the beautiful, five-tier 18th-century Estate Theater, where Mozart’s Don Giovanni (1787) and La Clemenza di Tito (1891) were first performed. In its foyer we heard a brief concert for woodwind quintet playing arrangements from Mozart operas and a piece by the Czech composer Frantisek Saver Dusek. 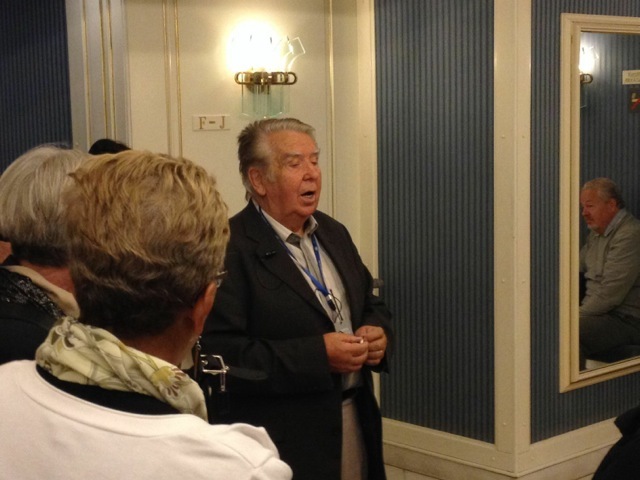 But the highpoint was an impromptu rendition of the Czech national anthem by Vaclav Bechyni, the theater’s charming guide. listening to Vaclav Bechyni singing the Czech national anthem. That evening a number of us went to a performance of Dvorak’s three act water-nymph opera Rusalka at the State Opera, built in 1888 as Prague’s German Theatre. The production was traditional, with English super-titles helpfully provided for those of us who can’t follow the Czech. We heard our last concert in Prague on Monday morning, October 7, at the Lobkowicz Palace – part of the vast Prague Castle complex – under three enormous chandeliers in a small hall decorated with trompe l’œil columns and niches. The performance, by a string quartet, began with a rendition of Beethoven’s Ode to Joy but came to an abrupt halt when the first violinist suffered a snapped string. He returned quickly, but rather than picking up again with the Beethoven, the musicians proceeded to the Pachelbel Canon and then on through various transcriptions (movements from a Beethoven piano sonata, Dvorak’s New World Symphony, etc. ), and concluded with Amazing Grace, Roy Orbison’s Pretty Woman, and some tango. At the Lobkowicz Palace we were also able to see some of its amazingly rich collection of music manuscripts and first editions, including a score of the Messiah with Mozart’s alterations, the orginal orchestral parts of Beethoven’s Fourth Symphony (dedicated to the seventh Prince Lobkowicz), the first edition of Beethoven’s Eroica Symphony (re-dedicated to Prince Lobkowicz after the original dedicatee, Napoleon, declared himself Emperor) and a copy of Beethoven’s Op. 18 Quartets with corrections in his own hand. Finally, at our last stop – Cracow, Poland – we attended a private, all-Chopin recital at the city’s music conservatory on October 9 (Wednesday). 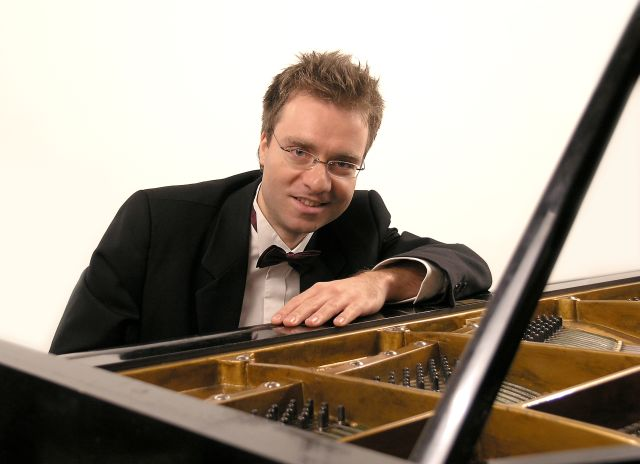 Some from our group thought the pianist, Paweł Lubica, played harshly, but the acoustics didn’t help: the building had been constructed as an insurance company office, and the concert was held in a two-story former reception room with very hard surfaces. Lubica played three waltzes and a sampling of other forms favored by Chopin (a Ballade, a Mazurka, a Prelude, a Nocturne, a Fantasie-Impromptu, and a Polonaise). My own favorite was the Nocturne (B major, op. 62, no. 1), and I was reminded of the pianist Rudolf Serkin’s observation that he wouldn’t play the Chopin nocturnes because they were too sad. Sadness is a good segue to our journey’s end! But sad only because it was such a great trip – the river, the sites, the people, the music. Thank you to everyone for helping to make it such a wonderful experience. 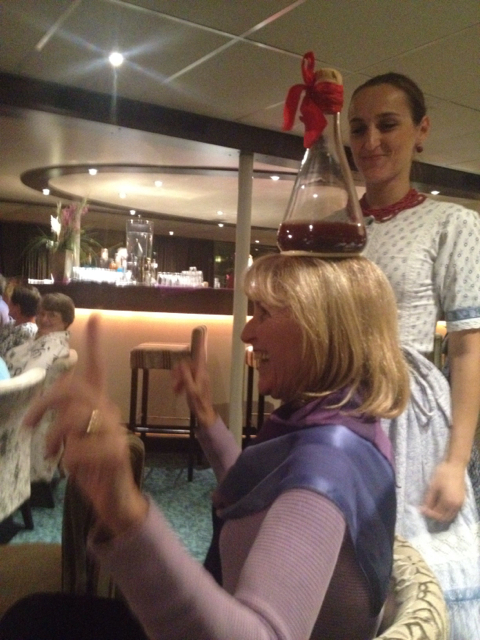 Proud Penn Alumni along on the Danube cruise. Penn Alumni is proud to present the 2013 Penn Alumni Film Festival Lineup! Join fellow alumni, faculty, and students for a weekend of film screenings and panel discussions. Space is limited, advanced registration is encouraged. Co-curators David Novack, ENG’86, PennDesign faculty and documentary filmmaker and Nancy Levy Novack, C’87, PennDesign faculty and Emmy award winning film editor, will share turning points in film sound’s history. Clips will be shared and the floor will be open to robust discussion. Don’t miss the chance to meet the student filmmakers and network with alumni in the film industry. Join fellow alumni and students for a screening of five short films, each written, directed and produced by current Penn students, ranging in genre from drama and documentary to animation and experimental. Head Games exposes viewers to one of the leading public health issues of our time, concussion. The film features several of Penn’s leading scientists and clinicians interested in providing evidence-based treatments and improving the lives of those who have experienced lasting effects from a traumatic brain injury. Stick around after the documentary for a panel discussion with medical experts. Rita Barnard, Professor of English and Comparative Literature at Penn, will introduce the film. To date, she has published two books: The Great Depression and the Culture of Abundance and Apartheid and Beyond: South African Writers and the Politics of Place. She is also the editor of The Cambridge Companion to Nelson Mandela (forthcoming in 2014, in time for the 20th anniversary of South Africa’s democracy) and is working sporadically on a series of essays on apartheid education. 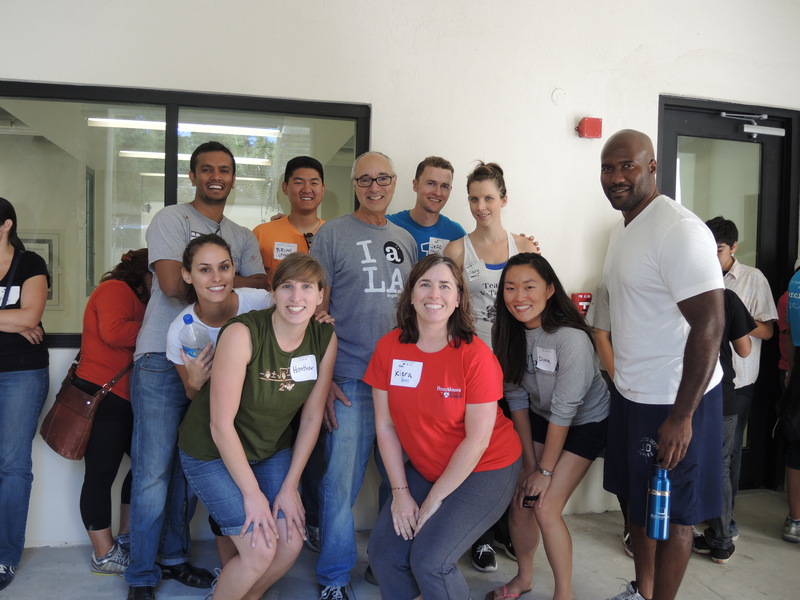 Penn Serves LA, the community service initiative launched in 2012 by Jane Gutman, CW’73, PAR’14, PAR’16, Leanne Pyott Huebner, W’90 and Denise Winner, W’83, continues to offer events to bring Penn Alumni in Los Angeles together to serve. 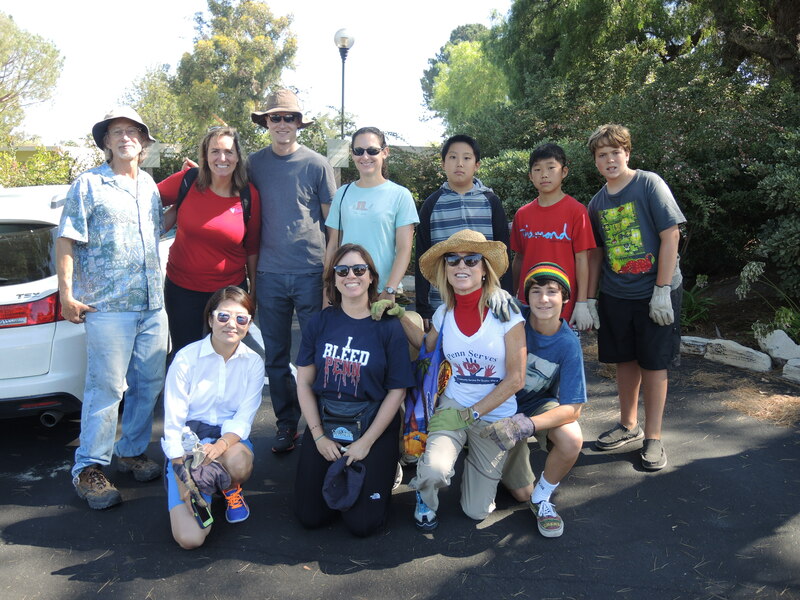 On August 24th, a group of Penn Alumni and their children gathered for a day of environmental cleanup and nature restoration at the Canyon at Chadwick School on the Palos Verdes Peninsula. The group learned about the local habitat, wildlife, conservation and environmental challenges impacting the community from the leading Southern California bird expert and past President of the Southern California Audubon Society. The Penn Serves LA crew as we start the day. We started our efforts by bringing cleared brush up the canyon to a holding area at the top of a steep hill. 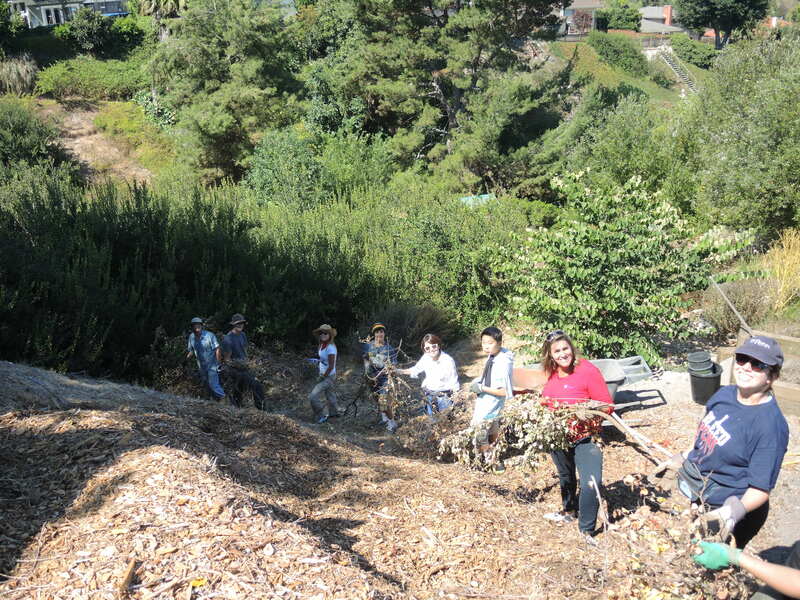 It was steep and sometimes difficult to grab the prickly branches, but we developed an assembly line and quickly moved a huge pile to the top of the hill. Then, we hiked into the canyon for shade, a water and watermelon break (thank you Denise!) while we learned about efforts to bring back the natural habitat of the canyon and rid it of invasive vegetation. After our break, we set out with shears, clippers and other gardening tools to clear back plants, bushes and trees from the trail. I tasted some of the wild lemonade berries – tart and sweet. The sun was hot, but many hands made quick work. You can see more photos of our work that day here. Next up, Penn Serves helped at the L.A. Leadership Academy in the Lincoln Heights area of Los Angeles on September 28th. Our mission was to help move classroom supplies into the new school building and interact with some of the college bound students and their families. The school is a charter school that is devoted almost solely to serving children in poverty, 95% of its student body is on free and reduced lunch. How many Penn alumni does it take to lift this heavy desk onto a dolly? Three plus one (representing the College, Wharton and Engineering no less!). Although we initially thought we’d be painting, it turned out that the school scheduled our Saturday to be a move day, and we would be helping the students, their families and school staff move fifteen classrooms worth of furniture and supplies from the front building into the new middle school in the back. 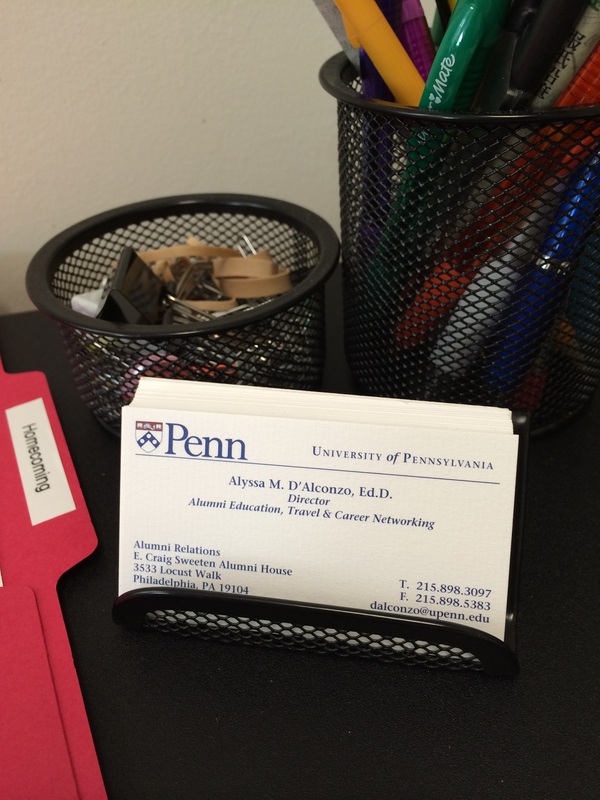 The Penn group, which included many former Penn Serves participants, quickly got to work moving desks, chairs, books and science supplies. 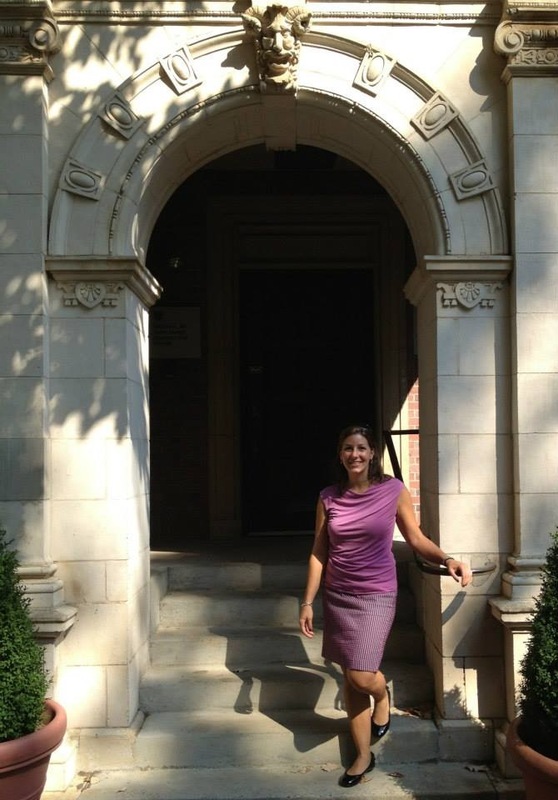 Down a long hall, then a flight of stairs and through the old school, into the courtyard and into the new building – things that seemed light when we started became heavy pretty quickly. But everyone was in good spirits. We stopped for a lunch break, and the school principal gave a special shout out to our group as other than the families that were there, we were the only ones helping. 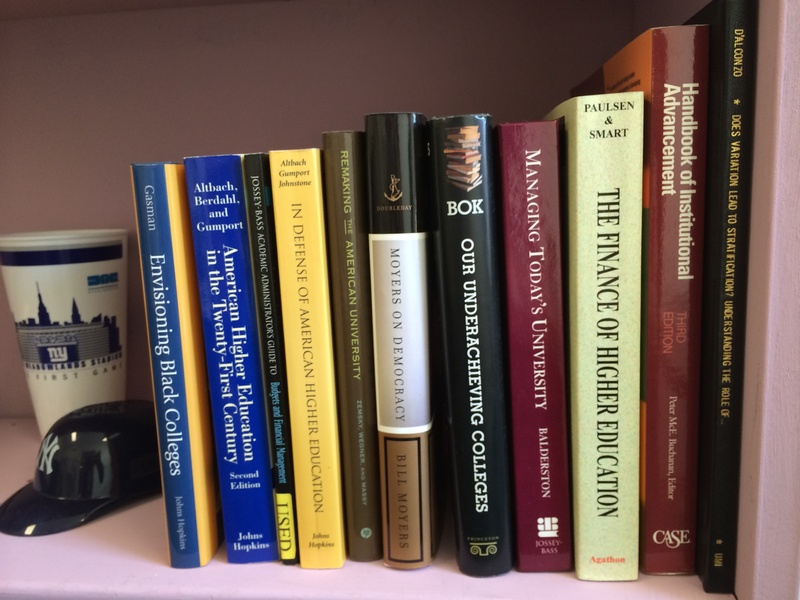 In the course of moving things up and down the stairs, we learned that the school’s founder, Roger Lowenstein, was the college roommate (at the University of Michigan) of Wharton Professor Michael Useem! What a small world. After lunch, we got to work setting up the science classroom (and reminiscing about our own science classes as we unpacked lots of glass beakers). 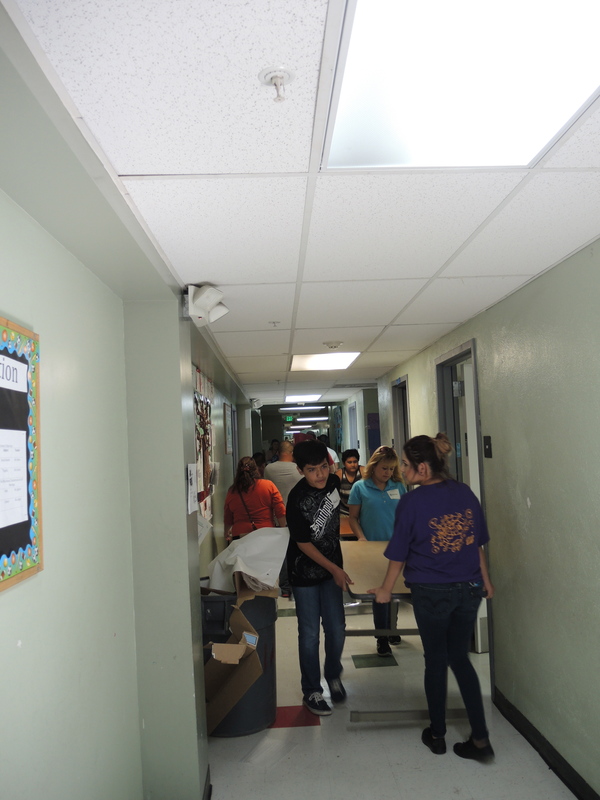 Everyone in the school community helped with the move. Here some of us take a lunch break (the others were still moving!). You can see more photos of the day here and on the Penn Club of Los Angeles’ Facebook page. If you live in Los Angeles, I encourage you to join us at an upcoming Penn Serves LA event – the service activities planned benefit a variety of non-profits in the area, and each service project is in a different part of the city. This provides an opportunity for alumni to join in a project that is of particular interest, or in a more convenient location, and also offers the opportunity to learn about the many organizations serving the Los Angeles community. The next event is planned for Sunday, November 17. We’ll be writing letters to American troops at the Red Cross. For more information and to RSVP, visit the PennClubLA website. About Penn Serves LA – Started in 2012, Penn Serves offers a way for direct community service for local Penn alumni and their children to serve Los Angeles’ most needy populations. We partner with established nonprofits and grassroots organizations for one-time volunteer opportunities. So far, we’ve served meals to the homeless, delivered food to low income families, planned activities with immigrant children, and so much more. Please contact us if you’d like to help at a future event: pennservesla@gmail.com. As many of you may know, Penn has a rich theater community. What you don’t know is that I am very experienced in the theater arts and have been working in various theater productions since I was very young. Since I went to Girard Academic Music Program, a music based high school, I was given many opportunities to be involved in their musical theater community. In fact, in my senior year, not only did I perform in GAMP’s production of Grease as a dancer, I also worked with their costume crew and created a good part of their set. Since theater was such a big part of my high school career, I really wanted to get involved in the theater community here at Penn. In the beginning of the semester I interviewed to set design/crew for multiple theater groups on campus. That night I sat up late into the night awaiting the results. Lucky for me, I was offered a position as set designer for iNtuitons’ production of Midsummer Night’s Dream and as a set crew member for Stimulus Children’s Theater’s production of You’re A Good Man Charlie Brown! This week marks the week for preparing the set for Midsummer Night’s Dream. On Sunday, we load in to Class of 1949 Auditorium and begin Tech Week! That means we laboriously bring the set from the PAC Shop at 40th and Walnut streets all the way to Houston Hall! From there we will construct the set from the pieces we created in the PAC Shop. I’m really excited to see my designs come to life finally! On Monday, I have my very first (but not last) walkshift! This is when all of the cast and crew of Midsummer take turns standing on Locust Walk selling tickets and advertising our show! It should be a fun time and hopefully not too cold. Our opening night is Thursday, November 1st. At this point in time, I’ve only seen the run through rehearsals, and they were AWESOME. Needless to say, I’m extremely excited to see how the show looks with the lights, set, and costumes put together finally. It was a true joy to work on this show and I feel a true part of the theater community here at Penn!